Enjoy your stay here while you browse our array of Personalized Hotel Guest Directories or Hotel Guest Information Binders for some of the finest resorts, hotels and high attraction locations for hospitality in room service or front entrance locations. Make this one of your amazing line of products even if its for a decorative purpose in the room. 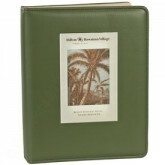 Other known names are hotel directory book, hotel guest information binders, hotel directory book, hotel directories, hotel binders, room service binders, acrylic guest directories all produced here by All Book Covers. A large selection of top tier level covering materials. All directories have heavy flat board, square corners, exposed rivets and black 10pt Goat Grain Lining. For Customized Guest Directories, New Concept Demos Design you want to present at a Special Event, Launch Event that meet minimum quantity order requirements, click here to Request a Quote. Please include if you have any artwork, tip-ins, or medallions to incorporate (specific artwork formats must be *.AI format, *.ESP format, or *.PDF format as High Vector Resolution), and if any different sheet sizing not shown already from our items here.